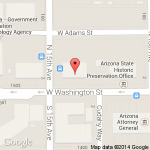 The State of Arizona Acupuncture Board of Examiners (Acupuncture Board) Web site is provided as a public service. Please note that users of this Web site are responsible for checking the accuracy, completeness, currency and/or suitability of all information. Information posted on the Acupuncture Board Web site is current as of the posting date of the information. The Acupuncture Board makes no representations, guarantees, or warranties as to the accuracy, completeness, currency, or suitability of the information provided on this site. The Acupuncture Board specifically disclaims any and all liability for any claims or damages that may result from providing the Acupuncture Board Web site or the information it contains, including any Web sites maintained by third parties and linked to the Acupuncture Board Web site. The responsibility for content rests with the organizations that are providing the information. The inclusion of links from this site does not imply endorsement by Acupuncture Board. Acupuncture Board makes no effort to independently verify and does not exert editorial control over information on pages outside of the Acupuncture Board Web site. Acupuncture Board does not endorse, unless specifically stated, any of the products, vendors, consultants, or documentation referenced in this Web site. Any mention of vendors, products, or services is for informational purposes only. Acupuncture Board does not collect or track personal information from Acupuncture Board Web site visitors unless we are given explicit permission by the visitor. Generic information from server logs may be used to track the number of hits to the site and to find out what types of browser software are used by visitors. This information will be used only in aggregate form solely for improving Web site design. Our goal is to provide citizens a more convenient and efficient means with which to interact with the Acupuncture Board. If you choose not to participate in these activities, your choice will in no way affect your ability to receive services. If you prefer to apply for services in person, you may do so at the Acupuncture Board office. The State of Arizona does not collect information about you unless you voluntarily participate in an activity that asks for such information. The information requested and supplied by you through the Acupuncture Board Web site, is the same information requested if performed in person at the Acupuncture Board office. Please be aware that in the State of Arizona, laws exist to ensure that state government is open and that the public has a right to access appropriate records and information possessed by the state. However, if personal information is requested on the Web site or volunteered by the user, state law and the federal Privacy Act of 1974 may protect it from release or disclosure. Should you have any questions, contact the state agency directly about the records they keep and their use of information. The Acupuncture Board and its consultants, as developer and manager of this Web site, have taken several steps to safeguard the integrity of its computer systems and networks. Security methods and measures have been integrated into the design, implementation and day-to-day practices of the entire Web site.